This quality 112 guitar cab comes with a T nutted removable back panel for easy on and off open or closed operation. This full size 112 cab has the front baffle board tilted back to point the speaker upwards towards the players instead of shooting into your ankles. This is an all black stealthy looking cab. This high quality cab is made of 3/4 inch 13 ply Birch plywood with rabbet and dado interlocking side joints for extreme strength. There is a sturdy strap handle on top. The cab comes with four rubber feet on the bottom. The 12″ speaker is rear loaded with T Nuts which makes it easy to swap out speakers for tone experimenting. We have many choices of quality Celestion guitar speakers to fit your precise tone preferences. Please go to Celestion.com to read about or to listen to sound samples to help you decide which are best for your playing style and tone requirements. It has been our experience that some of the favorite speakers for this cabinet are the Industry Standard Celestion Vintage 30 at 60 watts for all around great tone. The 30 watt G12H30 70th Year Anniversary special is also a favorite because it has a big rich warm low end, smooth mids with just a hint of grit when slightly overdriven and nice top end. The Celestion G12T75 (used in many Marshall cabinets) has lots of crunch, big bass, scooped mids and sizzling highs at 75 watts. The Celestion Greenback will give this cabinet early cone break up for classic warm low wattage tone at 25 watts. For fantastic natural sounding high power clean tones, the 80 watt Celestion Classic Lead 80 is the Celestion that most faithfully reproduce your signal rather than to add any color or character to your tone. Great for modeling type amps or situations where you want neutral clean clear reproduction. Our Hellatones are also great because the Hellatone 30 IS a slightly broken in Celestion G12H30 and the Hellatone 60 is a slightly broken in Celestion Vintage 30. The English Fane speakers sound fantastic with their high definition clarity. 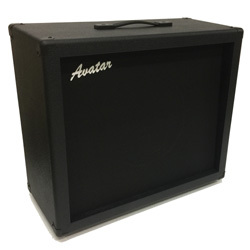 The cab dimensions are 24″W x 21.5″H x 11″D. Weight is approximately 45 lbs depending on speaker. Guitar cabs are not sold on a trial basis and are not returnable. You get a One year limited warranty. The cab does come with four rubber feet on the bottom but they have just been cropped out of the photos. New with Finger Joints and Salt+Pepper Grill!